We know that many people like Reader because it makes it so easy to share interesting stuff with a wide group of friends. That's why, over the past year, we've added a number of features to help you share the content you find most interesting: comments, following, people search, liking, and "send to." However, even with all these great features, sharing has been mostly limited to the subset of your friends who use Google Reader. While many people use Reader, we know that even more use Gmail. That's why today, we're thrilled to announce that with the launch of Google Buzz, the awesome items you share in Reader can also be shared with all your friends who use Gmail with Google Buzz. Getting started with Google Buzz is easy. Just head over to Gmail and you'll be able to link up your Google Reader account with just a few clicks. 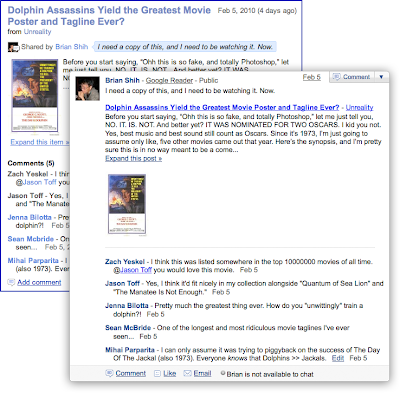 Then, anything you share in Reader will automatically be posted to Buzz. Comments are even shared between both products, so you can view and participate in the conversation wherever you'd prefer. And don't worry, you don't have another list of friends or followers to manage. The people you follow in Reader are the same people you follow in Buzz – those you've already chosen to follow in Reader, plus the people you email and chat with the most in Gmail. Check out the video below, explaining everything you can do with Google Buzz! Head to our help center for more details about the Buzz integration in Reader, or leave us feedback in our forum, on Twitter or even using Buzz itself. P.S. Keep in mind that Google Buzz is rolling out gradually, it might be a few days before you get it for your account.